The US is once again in the middle of a presidential election, with possible consequences this time that are more worrying than ever. And once again it is an election where the candidates focus their attention on a limited sub-set of US states – those states where the result is expected to be relatively close and winnable by a candidate if given sufficient attention. This is a consequence of the unique US system where presidents are selected not by who receives the most votes in the nation, but rather by who wins a plurality of votes in individual states whose electoral college votes sum to 270 or more (i.e. more than half of the total 538 electoral votes allocated across the nation). It does not matter if the candidate wins the state by a little or a lot; they receive the same number of electoral votes from the state regardless. Hence if a candidate is almost certain to win a state, as well as if they are almost certain to lose a state, it makes no sense to campaign there. They gain nothing by winning by somewhat more, or by losing by somewhat less. Total votes in the nation by the population do not count; only electoral votes count, and these are won at the state level. This is not a democratic system, and no other democratic country in the world with a president with substantial real powers selects their president this way. There are systems in some countries with a parliamentary form of government (where the party with a majority of seats in the parliament selects the prime minister) that might be seen as somewhat similar to an electoral college. But in such situations, the president is largely or totally a figurehead. In no other democratic country where the president is the head of the executive branch, other than the US, does one select that president other than through a popular vote of the entire nation. Until recently, I had thought there was nothing one could do about this in the US other than through a constitutional amendment. And a constitutional amendment on such an issue with divided interests, especially in the current political environment, is a non-starter. But there is in fact an initiative, already well underway, that would resolve this problem through a compact being reached across states that have at least 270 electoral votes between them. It is actually pretty ingenious, and might well pass. It is certainly in the interest of the three-quarters of the states that are not swing states to see it approved. 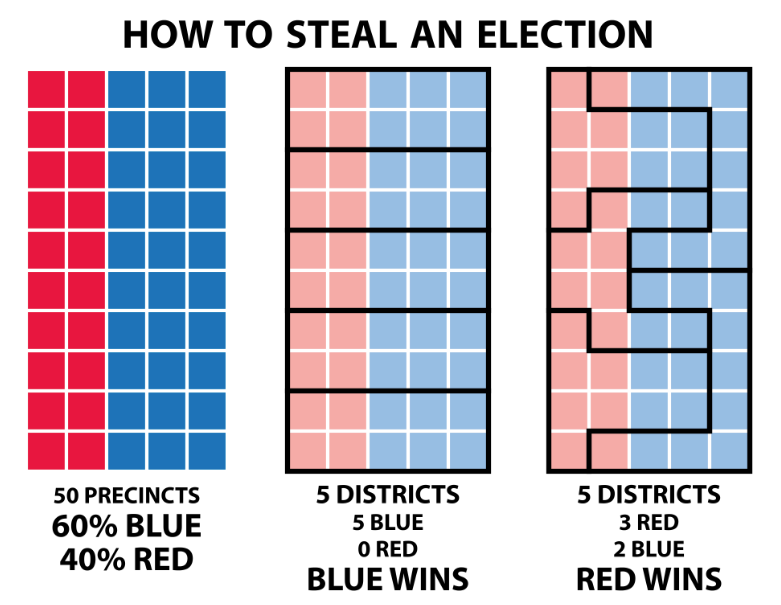 This blog post will first review some of the problems that come out of the current electoral college system. It will then describe the National Popular Vote Interstate Compact, where an agreement would be reached to ensure electoral votes are cast for the candidate receiving the most votes nationally, and not necessarily the most votes in the individual state. The benefits of such a system will then be examined, as well as the politics of whether or not it will ultimately be approved. To start, the current system is not democratic. Electoral votes are allocated by state to be equal to the number of congressmen from that state plus two (equal to the number of senators from each state). There are 538 electoral votes, the sum of 435 Congressmen, 100 Senators, and 3 electoral votes granted to Washington, DC, by the 23rd amendment to the Constitution (ratified in 1961). The result is that voters in a state like Wyoming, a small state with fewer voters even than Washington, DC, have a disproportionate share of influence in the electoral college and hence in the selection of the president. In 2012, the voting-eligible population (VEP, equal to the voting age population of the state, less non-citizens and felons ineligible to vote) of Wyoming was 425,142. With 3 electoral votes, Wyoming had 141,714 voters per electoral vote. In contrast, the voting-eligible population of California in 2012 was 23,681,837 for 55 electoral votes. Thus there were 430,579 voters in California for each of its electoral votes. That is, there were almost exactly 3 times as many voters in California per electoral vote as there were in Wyoming. Each vote in California counted only one-third as much. This is not democracy. In a democracy, each vote counts the same. That is, it leaves the method to be used in a state up to the legislature of that state, with the only constraint being that the electors may not be a US Senator, a US Congressman, or a federal government official. Not surprisingly, the states used a variety of ways initially to choose their electors. In 1789 (when George Washington was ultimately chosen as president), there were direct popular at-large votes within a state to choose the electors in only two of the states (Maryland and Pennsylvania), and popular votes but by specially drawn districts within the states in two more (Delaware and Virginia). The electors were simply chosen directly by the state legislatures in four of the states, and two states had hybrid systems where the voters chose a list of possible electors and the state legislatures then chose the specific electors from those lists. Finally, one state (New York) could not decide in time what to do, and hence did nothing. Two more (North Carolina and Rhode Island), did not accede to the Constitution until after the process was over. In the early years of the republic, states frequently changed their system of choosing electors. But over time, states shifted to systems where their state population would vote for their electors, as is now the case in all states (with Maine and Nebraska choosing them by votes in individual congressional districts, plus two for the winner of the state-wide vote). The election of 1824 is generally taken as the first election where the popular vote totals were meaningful (even though in that year, 6 of the then 24 states still had their electors chosen by their legislatures). Indeed, it appears that there is not even any record of what the vote totals were (in the states where votes were used) in the elections before 1824. As noted, the framers of the Constitution never viewed this system as democratic. It was only later that the myth grew that the US is a great democracy, including in how it elects the most important official in the land. We don’t, and this should be recognized. Directly following from the fact the current system is not democratic, is the possible consequence that whomever receives the most votes might not win the presidency. It is worth flagging this separately only because many believe that while this is theoretically possible, in practice it has been and would be so rare that we should not worry about it. The results of the 2000 election between George Bush and Al Gore did serve to wake people up that this result is indeed possible in modern times. Al Gore won the nation-wide popular vote over Bush by a not so small 0.5% points (544,000 votes), but lost due to a loss in Florida. Furthermore, the loss in Florida was by just 537 votes, or 0.01% of the votes cast in that state. But this loss was due to the use of the terribly designed and now infamous “butterfly ballot” in Palm Beach County (and only that county), where to vote for Al Gore, whose name appeared second on the ballot, one had to punch the third hole in the column to the right of his name. Punching the second hole would be a vote for Pat Buchanan, a minor third party candidate who received only 0.4% of the votes in the country. A careful statistical analysis of the Palm Beach County results indicate that at least 2,000 votes intended for Al Gore mistakenly went to Buchanan. This was far more than the 537 vote state-wide margin. Without this confusing ballot in just one county, Al Gore would have won Florida and the presidency. The impact of the Florida result on the 2000 election is well known. And if it were not for the electoral college system, where electoral votes are allocated by state and with winner-take-all in each individual state or district, there would not have been such an impact from one poorly designed ballot in one county of one state. Al Gore won the popular vote in the country by over a half million votes, and a badly designed ballot in one jurisdiction would not have mattered. And it is in fact not so rare that there might be an election where the winner of the electoral vote lost the popular vote. Aside from the 2000 election, there were three other such cases in American history (although all were in the 1800s). Thus in the 48 presidential elections since 1824 (the first election where, as discussed above, the popular vote at the state level was meaningful), there have been four cases where the person elected president received fewer votes than his opponent. That is, in one of 12 cases (4 in 48) the loser of the popular vote still became president. One in 12 cases means, on average, that one might expect there to be such a case every 48 years or so, given the four-year presidential terms. That is, each voter should expect this to happen about once in their voting lifetimes. That is not uncommon. Beyond any statement of principle, there are also other, and highly important, problems stemming from the current system. As a direct consequence of the current system, presidential candidates and their campaigns will focus their efforts and policy commitments not on the nation as a whole, but only on the limited number of swing states (also referred to as battleground states) where the race is so tight that the victor is not clear. While most are aware of this focus, the extent of the focus may be surprising. While the definition of precisely which states might be considered swing states will differ a bit between analysts, and especially for those states near the margin between being considered a swing state or not, there is actually a surprising degree of consensus. For the 2012 presidential election, 11 states were considered by most as swing states. They are shown in brown in the map at the top of this post. 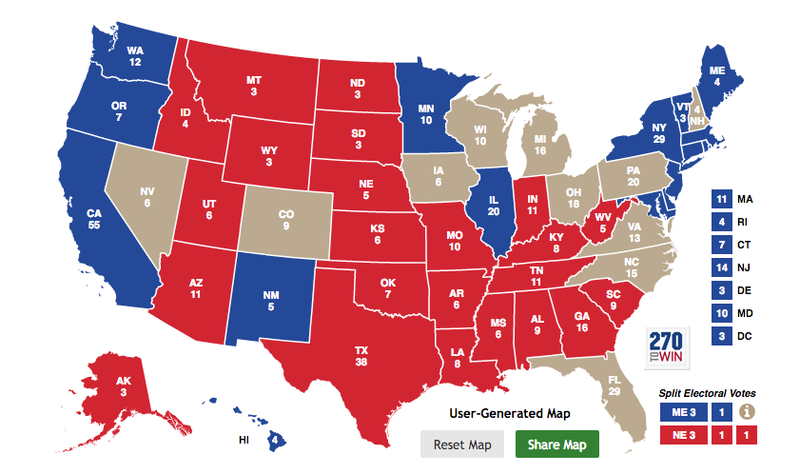 The only real debate is whether Michigan should be included, thus leading to 10 swing states. And some might have substituted Minnesota for Michigan. But these 11 states accounted for 99.6% of the campaign events held in the presidential campaigns in 2012, and 99.8% of the TV ad spending! The rest of the country simply did not matter, and was ignored. In 1996, when a number of the states considered to be battlegrounds in 2012 were not so before (as the list evolves, but slowly, over time), voter turnout was essentially the same as in the rest of the country (51.5% in this set of 10 states vs. 51.4%). But as these states became increasingly seen as competitive, with increased attention then afforded to them and with voters increasingly recognizing that their votes there could indeed matter, the turnout differential grew steadily, reaching a difference of 7.4% points in 2012. This is a big difference. States that gained battleground status in the 2008 election saw their turnout jump by 5.2% points, when national turnout rose by only 1.5% points. There were no such cases in 2012. States that lost battleground status saw their turnout drop by 2% points in 2008 and by 4.9% points in 2012. Other states had smaller changes. It should not be surprising that fewer people vote if they believe their vote does not count. And for a presidential election, if you do not live in a battleground state, it most certainly does not matter: One candidate or the other is certain to win that state. But while this is a problem in itself, there are important implications for the other offices up for election in that year. Fewer people will vote in the non-battleground states in the congressional and senate races, and for the various state and local offices and referenda that might also be on the ballot. What is perhaps surprising is that such support is basically identical between Republicans, Independents, and Democrats. This is not a partisan issue. Other polls have found similar results (see for example this poll, specifically question # 22). While the problems with the electoral college system have long been recognized, most (including myself) thought until recently that a constitutional amendment would be required to change it. But in fact that is not so. Following the 2000 election debacle, Professor Roger Bennett of Northwestern University Law School pointed out that the US Constitution (in its Article II, Section 1, Paragraph 2, quoted above) gives state legislatures the power to decide how electors will be chosen in their state. States could use this power to choose a slate of electors pledged not to the presidential candidate who received the most votes within their own state, but rather pledged to the presidential candidate who received the most votes in the nation. This is simple and clear, and provided states with electoral votes that sum to 270 or more agree, we could have the democratic election of the president where the candidate who gets most votes nationally, will win. The mechanism is the approval in each state of legislation that would commit that state, provided other states holding 270 or more electoral votes also agree, to select electors from the slate committed to the candidate that wins the most votes nationally. So far ten states plus Washington, DC, have approved and signed such legislation. They hold 165 electoral votes between them, and approvals include from such large states as California and New York. Not only does this approach by-pass the need for a new constitutional amendment, but it also does not give a veto right to the small number of states who benefit from the current system. For a swing state, and particularly for a small swing state, the current system has its advantages. Presidential candidates are forced to pay special attention to you, and to grant you special favors that others may not enjoy and which could indeed cost others. But the system effectively ignores the voters in more than three-quarters of the states, and the National Popular Vote initiative is a mechanism to restore their democratic rights. One should not want to grant a veto right to this to a small number of swing states who benefit from the current system. Votes would count the same across the nation. Currently, a vote in California counts only one-third as much as a vote in Wyoming in terms of electoral votes. It would end the possibility that a candidate receiving more votes than another would nonetheless lose the election, as happened in Bush vs. Gore in 2000 and three other times in US history. There would be less incentive than now for states like North Carolina, Florida, and Pennsylvania to try to introduce measures to selectively disenfranchise targeted voters (such as the poor or from minority groups) through voter ID and similar restrictions. Such voter disenfranchisement measures can be effective at the margin, where by shifting voting shares by a few percentage points in the state the favored candidate might win that state. But if what now matters is the total votes cast in the nation, a swing of a few percentage points in a few states such as Florida are less likely to decide the outcome. I should add, however, that while there would be less of an incentive to introduce such voting measures for elections for the president, the incentive would remain for state and local offices. But perhaps the biggest concrete impact would be the impact of such a reform on how candidates run for office. Instead of focusing almost all of their attention on a limited number of swing states, they would now have a reason to campaign across the entire nation. Their aim would be to pick up votes wherever they can. Thus a Republican would want to campaign in states like California, New York, and Massachusetts. While he might not expect to win a majority in such a state, there are a large number of potential Republican voters in such states whom he would want to encourage to go out and vote. Similarly, a Democrat would have an incentive to campaign in states like Texas and Alabama. Their aim would be to campaign wherever they might gain a significant number of votes, including in states where they might well still expect not to receive a majority overall. This would change the dynamics of US presidential campaigns, and in a good way. Three-quarters of the nation would not be neglected. As noted above the National Popular Vote Interstate Compact has now seen legislation passed and signed in ten states plus Washington, DC, who between them have 165 electoral votes. Maryland was the first (in 2007) and New York the most recent (in 2014). Unfortunately for the politics of this, all the states (including DC) who have passed this are strong “blue” (Democratic leaning) states. No red states have as yet passed it, although such legislation has been passed in one but not both of the legislative chambers in red states such as Arizona, Arkansas, and Oklahoma. Many Republicans appear to believe that selection of the president by popular vote would not be of benefit to them. But this is not at all clear. First, it is quite possible that more Republican votes would be gained on a net basis in states like California, New York, Illinois, and others, than would be gained on a net basis by Democrats in states like Texas. It is very difficult to predict what the net impact on votes will be because, as noted above, the focus of attention of the election campaigns would then be totally different than what it is now. While one could safely predict that voter turnout will rise (it is abysmally poor in the US), whether the fact that all votes would count (and count equally) would favor one party or the other is not at all clear. But what is clear is that under the current electoral college system, many observers have concluded that the Democrats have a clear electoral vote advantage over the Republicans. While there are various ways that they have come to this conclusion, one example is based on an examination of which states have voted for the Democrat in every one of the six presidential elections since 1992, in comparison to the states that have every time voted for the Republican. The Democrats have a huge electoral college advantage by this measure, with 19 states plus Washington, DC, having always voted for the Democratic candidate since 1992, with 242 electoral votes between them. This has been called the “Blue Wall”. Starting from this as a base, a win just in also Florida (with its 29 electoral votes) will hand the election to the Democrat (with a minimum of 271 electoral votes, even if no other state is won). The Republicans, in contrast, have consistently won only 13 states since 1992, with just 102 electoral votes. It is a far bigger reach for them to get to 271 electoral votes from this base. While there are also critics of this specific measure of the Blue Wall, most commentators agree the Democrats do have a major electoral college advantage. It is then not at all clear that Republicans should oppose a reform where the president would be chosen by a nation-wide popular vote instead. Presidential elections have generally been won or lost by only a few percentage points when measured in terms of the popular vote (in years other than when there was a major third party candidate, such as Ross Perot in 1992). Tellingly, even Newt Gingrich, the former Speaker of the House, former presidential candidate, and close advisor to Donald Trump, has endorsed the National Popular Vote initiative. Newt Gingrich is highly political. One would not expect him to do this if he saw it to be other than an advantage for the Republicans. The electoral college system might well have made sense in 1788, when the US Constitution was ratified. But that does not mean it makes sense now. While a formal constitutional amendment might well be a preferable solution, the current politics in Washington means that any amendment process would not go far. But the US Constitution does specifically provide the state legislatures the flexibility to decide how their electors are to be chosen. States can use that flexibility to direct that the slate of electors for that state will be the slate committed to the candidate who receives the most votes in the nation, rather than in the individual state. And the states can agree that they will begin to abide by this process when, and only when, states with a minimum of 270 electoral college votes have agreed. This is thus eminently doable. However, while states with 165 electoral votes have already approved this initiative, there is a need for states with a further 105 electoral votes also to agree. This will not happen until Republican controlled states recognize that this reform is as much in their interest as it is for others.